have many magazine pouches to choose from. 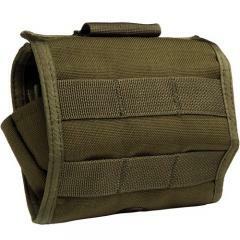 Keep extra rounds close and ready for rapid reloads with the Tactical Shotgun or Rifle Shell Carrier Pouch from Uncle Mike's. Perfect for tactical operatives and hunters alike, the versatile case is a convenient and reliable way to transport additional bulky or large firearm cartridges. The carrier is constructed from tough, weather-resistant ballistic nylon and folds compactly for easy transport. Interior rows of elastic straps securely hold bullets in place while leaving plenty of space for gripping. Once mounted, the pouch can be unrolled using the quick pull-tab, instantly providing shooters with access to up to 16-rounds of ammunition.